This globetrotting show is truly quite legendary, selling out in places like Edinburgh Fringe and Sydney Opera House. Basil, Sybil and Manuel serve a 3-course meal along with plenty of laughs and audience participation in this 5 star immersive show – a show that’s never the same twice, because it’s 70% improvised. It’s great for comedy and theatre fans, as well as anyone who just fancies going out for an unforgettable meal and a hugely good time. This true blend of ingenious comedy and unique theatrical script is a multi-sensory treat where chaos reigns right from the start. For more information about the show visit the website. Doors open half an hour prior to the performance start time. All tickets include a drink on arrival, a 3-course meal and 2 hour interactive show. *Includes a £1 booking fee. 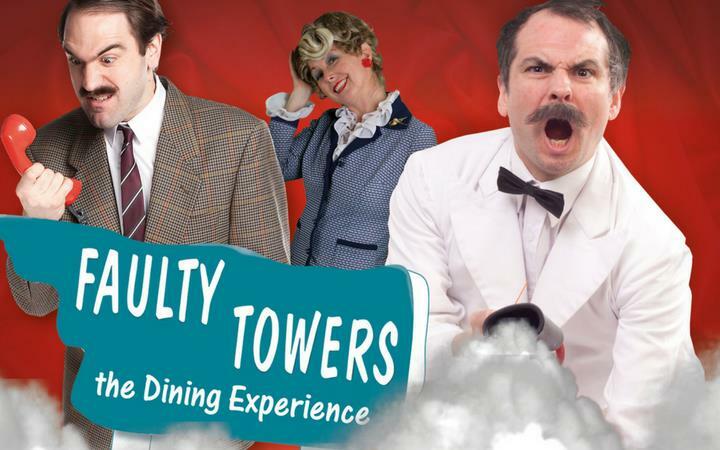 Please note: Faulty Towers The Dining Experience is an affectionate homage to Fawlty Towers, the BBC TV series written by John Cleese and Connie Booth. Their original TV scripts are not used in Faulty Towers The Dining Experience. Copyright Interactive Theatre International, 1997-2018.